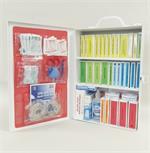 Kit for <40 campers: conveniently packed inside a 36 unit, gasketed, metal cabinet . Cabinet size: 13¾" L x 9" W x 3"
Kits for 40-90 campers and >90 campers packed in an Orange Trauma Bag measuring 17" x 10" x 8"
Whether you're teaching sports, housing a sleep away or day camp, or hosting a recreational town camp...we've got you covered! 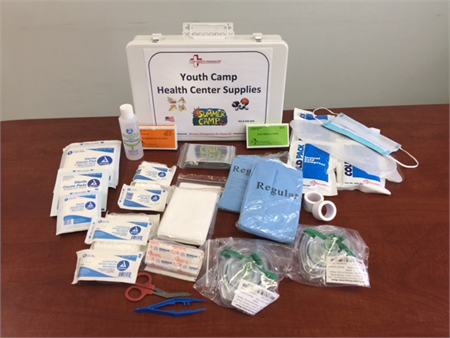 Our Youth Camp Health Center Supply first aid kits are easily portable. 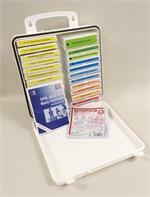 These kits come in either a metal cabinet or orange trauma bag, filled with supplies designed to treat most minor injuries, scrapes, and abrasions which occur in a day camp environment. 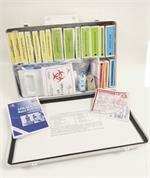 BE PREPARED... EMERGENCIES DO HAPPEN! Photos are representation only; actual items may vary from pictures. Perfect for outdoor activities, road trips, hiking, biking, sporting events, etc. 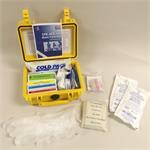 © 2019First Aid Products Online, All Rights Reserved.